Improve collaboration across your entire extended team or boost the returns from your Sharepoint investment with Huddle. Huddle keeps everyone and everything in sync. Our content collaboration software is used by more than 100,000 organizations worldwide, including AKQA, OmniComm, Publicis and marketing departments of Kia Motors, Panasonic, and Sherwin-Williams, to name a few. The old methods of collaboration in the workplace are broken, often times creating more work than necessary. Huddle and tibbr have teamed up to deliver the easiest, most secure way to access, share, and collaborate on content without having to chase anyone down. Harness all the powers of cloud, social, and mobile and hand them over to your workforce to get everything done faster than you ever thought possible. 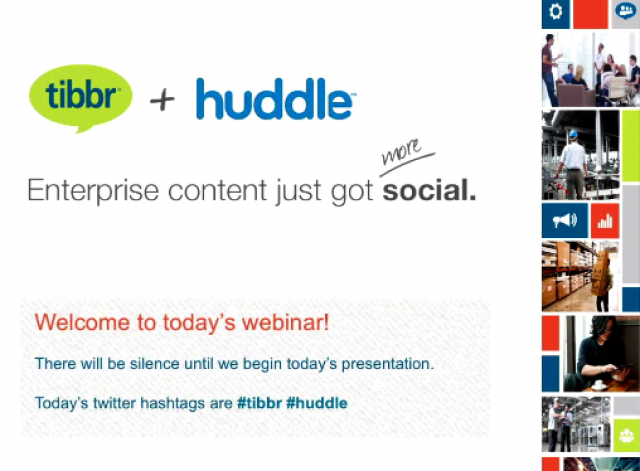 Join both Huddle and tibbr for a 40-minute webinar to see how they work better together. Huddle has partnered with the leading single sign-on providers to provide simple and secure access to your content. Once connected, you can sign into Huddle using just your network credentials; a secure solution where users don’t have to remember passwords and IT spends less time on password resets. Watch this short webinar and learn how you can improve your security. We sit down with Ann-Marie Cooper, Head of HR at Huddle, to discuss the issues she faces as an HR professional in the modern workplace, and the tools she uses to make her life easier.